There are many reasons to celebrate the life of the 41st president — one being disdain for broccoli. President George H.W. Bush hated broccoli. And in the wake of his recent passing, many fans of his legacy (and fellow broccoli haters) are still praising him for it. Former President George W. Bush announced his father's passing in a statement released Friday night. George H.W. Bush, who served as the president from 1989 to 1993, died at the age of 94. Even after his time in the White House, he and his wife Barbara, who passed away in April, remained pillars of the political community and were celebrated by politicians from both the Republican and Democratic parties. As America prepares for the funeral of the country's 41st president, many are also reminiscing about Bush's accomplishments, such as solidifying the country's position as a superpower or his time as the director of the CIA. However, there is one slightly unusual thing that many of his admirers haven't stopped celebrating for years: George H.W. Bush never did succumb to the powers of broccoli. And that's one heck of a feat. His hatred for the cruciferous green veggie continued for many years and in 2016, not even a persuasive (and darling) letter from a 5-year-old could convince the former president to touch the stuff. "My grama [sic] told me that you do not like broccoli and never want it served,'' the boy named Cooper wrote to the former president. "I just want you to know that I love broccoli. Mr. President, broccoli is really good for you. I wish you liked broccoli like I do." Bush had a kind, and very diplomatic response, to the young boy's letter. Since the former president's passing, fans are continuing to honor his disdain for broccoli across social media. Tweeters are writing warm tributes, such as: "May you not eat broccoli in Heaven, sir." 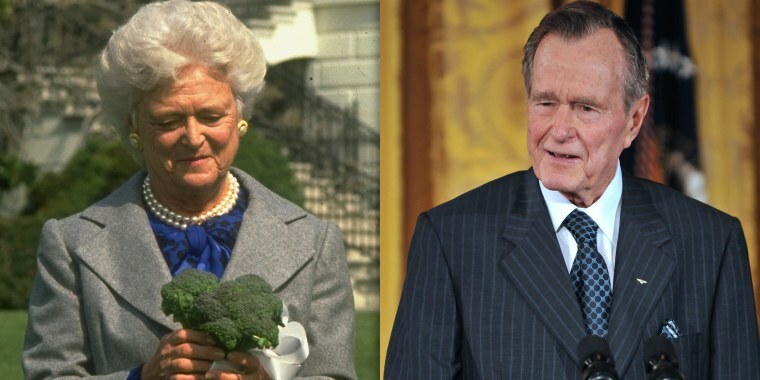 May you not eat broccoli in Heaven, sir, reunited with Barbara after 73 years of marriage. Prayers for the Bush family as we mourn the loss of our 41st US President. Both Republicans and Democrats have been able to come together over this somewhat partisan issue. I'm a Democrat, but I'm an American first. I am grateful for George Bush seniors service to our country. I don't like broccoli anymore either. Even lovers of broccoli are still paying tribute to the celebrated politician. This liberal liked ole George Bush. Even if he didn’t like broccoli. RIP. It's clear that George H.W. Bush was loved by many and paved the way for many future leaders ... whether they love broccoli or not.